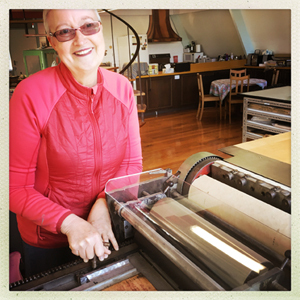 Please join the Agave Print Studio newsletter if you would like to receive information about events, workshops and classes. Gift Vouchers available for Workshops, Classes and Accommodation. In 2014 Dianne moved from Adelaide to Trentham in the Central Highlands of Victoria. Her artwork includes printmaking, encaustic, oil and pokerwork on wooden panels; artist books; on-glaze porcelain; and small scale bronze casting. In 1998 Dianne published ‘Printmaking with Photopolymer Plates’ and has taught workshops and classes in photopolymer printmaking in Australia, Greece, USA, Japan and the UK and has taught printmaking and other subjects at a range of tertiary institutions. In her current work Dianne combines a cast of characters, with cloudscapes and plant forms to create various scenarios. Her characters live in a world where nothing is certain.